If you want to drive like 007, chances are you’ll have to spend big bucks. But for those of lacking the coin to put us in a Lotus or an Aston, there’s a surprisingly affordable alternative that’s nearly as stylish and timeless as James Bond himself. 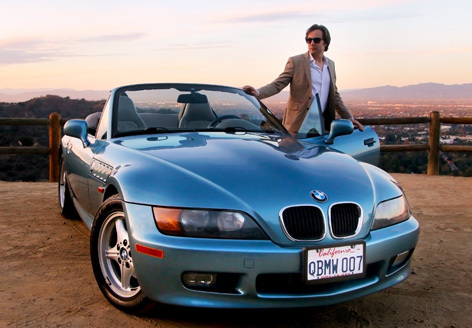 That would be the BMW Z3 that featured 20 years ago in the Pierce Brosnan debut GoldenEye. While the car was criminally underused in the movie, it does have the distinction of being one of only eight car models presented to 007 by Q in the film series. It was featured heavily in BMW’s marketing tie-ins at the time and can even be spotted on the film’s poster. The campaign was so effective that the first year of Z3 production was snapped up by pre-sales alone. This means that, unlike most Bond cars, it’s not hard to find a good one, or to keep it going as a daily driver without breaking the bank. My wife Athena Stamos and I were lucky enough to purchase one over a year ago. Here’s what we’ve discovered. 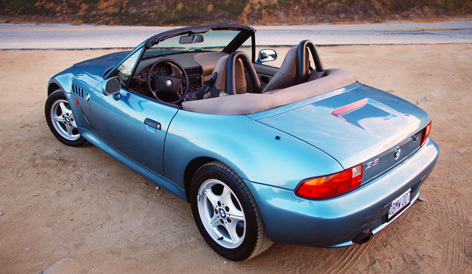 If you want to be accurate to the movie car (see it here), you’ll want a 1996-98 BMW Z3 in Atlanta Blue with tan interior and five-point grooved wheels. The shape of the taillights and front air dam changed noticeably in 1999. 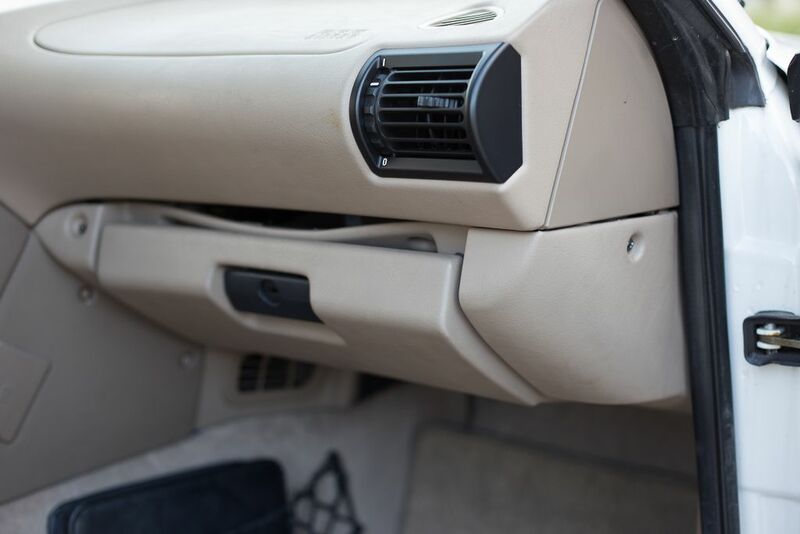 If you’re a real stickler for details you’ll want to avoid most 1998 models, which added optional black roll bars behind the passenger seats to protect the occupants in case of a rollover. Ours is a 1998 with roll bars, and we valued the added safety more than being 100 percent movie-accurate. Also note that US models like ours have a slightly different bumper with added side markers compared to Euro-spec Z3‘s. Our car does have the movie-correct black dash trim (only visible in one shot of the film), but many Z3’s have wood accents that add a welcome bit of luxury inside. Bond’s car (and ours) is powered by a 1.9 Liter 4-cylinder engine paired to a manual transmission with “5 forward gears”. A 2.8 Liter 6-cylinder was optional starting in 1997, but the styling of the six-cylinder cars look a bit different from the movie car due to a larger front air dam and wider “hips”. Although many people prefer the extra horsepower of the 6-cylinder (189 hp versus 138), we’ve found the 4-cylinder to be more than adequate for LA traffic and fuel prices. In a car this small and low, you always feel like you’re going faster than you are, particularly with the top down. A 4-speed automatic was also offered but saps a lot of fun out of the driving experience. Expect to pay anywhere from $3,500 for a tired runner to $7,500 for a low-mileage cream puff. A lot can happen to a car over the decades, so it’s highly advisable that you pay the $30 for a CarFax history report and spend $50 or so to get the car looked at by a BMW-knowledgeable mechanic before settling on a price. If you’re after something more special, and you’re willing to spend much more, the 1996 Neiman Marcus 007 Edition of the Z3 might be your ticket. Only 100 of these examples were made, all in the blue-and-tan combo. They command a huge premium due today because of their exclusivity, typically double the price of a comparable stock example. The Neiman Marcus Edition mostly amounted to trim differences. Wood inlays and 007 logos decorated the interior, while a chrome windshield surround and luggage rack shined up the exterior along with custom wheels. These changes ironically deviate the car’s look from the screen-used Z3 seen in the film, but are certainly of interest to more affluent collectors. All Z3’s require premium fuel but are relatively fuel efficient. The 4-cylinders were rated by the EPA at 20 mpg city/29 highway, we’ve found our car averages 24 mpg. Six cylinders are rated at 17 mpg city/24 highway. Automatic transmission cars typically get 1 mpg worse than the manuals. 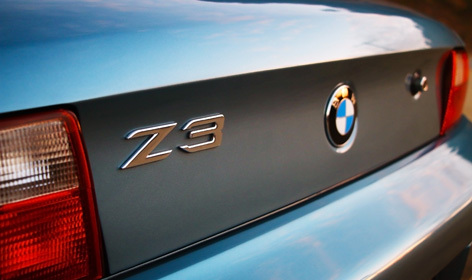 The Z3 is one of the best-handling cars in the world, with precise controls that make the car a joy to operate. It has a nearly perfect 50/50 weight distribution front-to-rear, owing to features like putting the heavy battery in the trunk, so the car loves to rotate around a turn. Even though it’s a convertible, it’s a surprisingly solid car with a stout Germanic feel. Our previous car was a 1998 Mazda Miata, which was lighter, cheaper, and more reliable. But in comparison it felt like a tin can, was smaller inside, had a choppier ride, and was very buzzy and tiresome on the highway. The Z3’s manual cloth top is heavier and therefore trickier to put down and up while sitting in the driver’s seat, but it’s possible if you’re limber enough or have arms like Daniel Craig. A detachable tonneau cover comes with the car that can bend and snap over the stowed top. It's finicky to attach, and takes up half of the trunk space when not in use, so we only bring it out when we want to show the car off in photos or parades. The Z3 is one of the most reliable BMW’s ever made, due to how relatively simple it is compared to its more complex stablemates (including the 7-Series seen in Tomorrow Never Dies). That said, it’s still not as trouble-free as your everyday Toyota or Honda, and any older car is going to need some investment to keep going. Unlike most American and Japanese cars, the tolerances and quality of cheaper parts won’t cut it in these precision cars, so parts are quite dear. Even with a good car, you have to be willing to spend one or two thousand dollars every year in maintenance costs. Thankfully there are some well-known trouble spots to check before you buy. 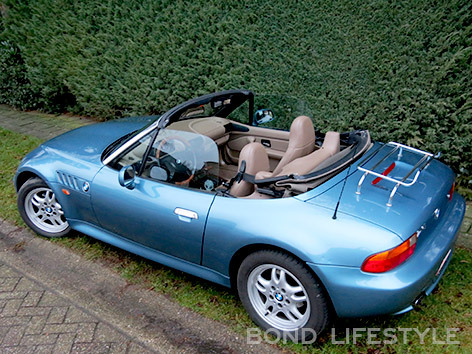 Early Z3’s were stuck with plastic rear windows, which tend to cloud or scratch over time because you have to bend the window in half to stow the top. An auto upholsterer can easily replace it, but expect to pay $400 or more for a new one. 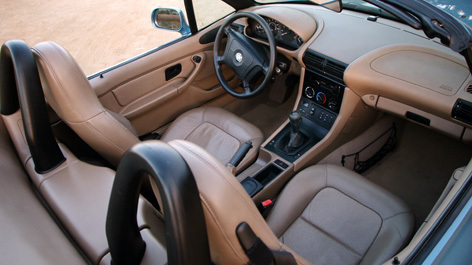 The typical 90’s car is known for brittle interior plastics, and the Z3 is no exception. Thankfully most of these pieces can be fixed without too much issue, particularly if you’re handy. The heavy glove box will typically sag over time (see example here) and chatter over bumps. We found a $30 metal bar kit that fixed the issue after a few hours of careful work. The rubber bushings for the seats get squashed over time, leading to an annoying back-and-forth rocking. New bushings are only $20 and there are several online tutorials to fix the malady, but you have to take out the seats. It took me and a mechanically-inclined friend a half-day to replace. The seatbelt guides are plastic and easily broken, and require unstitching the seatback to replace. After we got ours repaired, we installed a simple velcro kit to make sure they wouldn’t get busted again. Power seat, door locks, and windows are notoriously unreliable on all BMW’s. Each can be several hundreds of dollars to repair. They tend to fail gradually over time, so take note if there’s any hesitation with any of these controls. Another typical BMW issue, especially when the car nears the 100k mileage mark. Water pumps, expansion tanks, and leaky radiators are common. For example, a new radiator at the 85k mileage mark cost us $500 to have repaired. 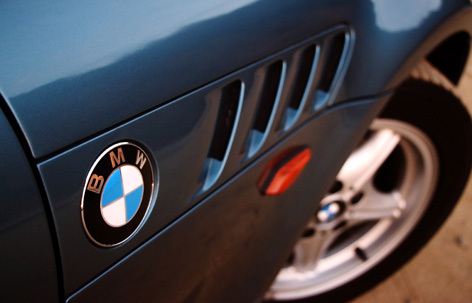 Make sure to give any Z3 a thorough test-drive and keep an eye on the engine temperature gauge and check engine light for any issues. The Z3’s rear suspension components were originally designed to handle the modest output of the base 4-cylinder engine. Unfortunately BMW didn't beef up this section when it installed bigger engines, and the higher torque of the these engines can twist and sheer the entire rear suspension from the back end of the car over time, essentially turning the car into junk. Signs of cracking and welds failing can be found in the trunk and underneath the car. It’s definitely something for a BMW specialist to look carefully for before buying, especially on the higher-powered models. Thankfully all these issues fade away when you drive the car. 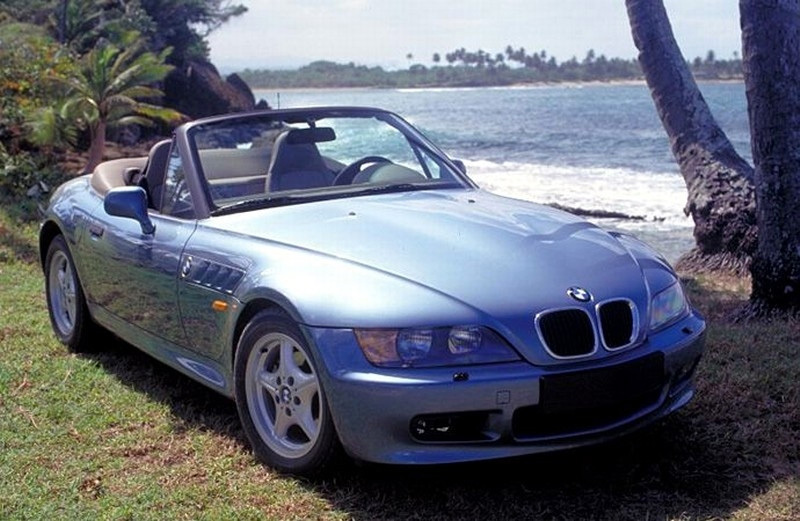 While the Z3 had precious little screen time in Goldeneye, the scene where Bond drives Natalya down the Caribbean coastline does a wonderful job conveying the blissful open-air experience that comes from driving a responsive roadster on a summer day. The styling has aged gracefully, and we find most people think it’s much newer (and more expensive) than it actually is. It's a car you feel equally comfortable driving every day to work, going on a road trip, or parking in front of an high-end casino. Brad Hansen is a life-long car guy and Bond fan. He shares his 007 fandom with his wife Athena Stamos, and they reside together in Los Angeles, California. Brad works there as a filmmaker/editor, and along with Athena created and made the web-series Star Cars for CraveOnline.com, which featured movie and TV cars including several 007 vehicles. 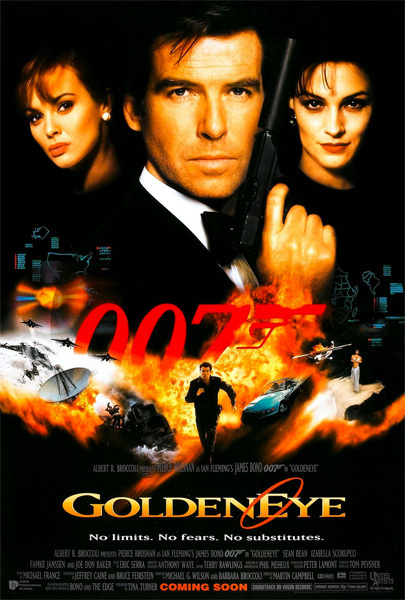 They have also filmed and edited several other highly-viewed YouTube Bond videos, including James Bond Deathmatch, The Spy Who Loved His Car, The Spectre Trailer: Classic Edition, and The Ultimate Bondathon timelapse with rankings. you're joking right? Anyone who has ever owned or driven an early model (especially the dreadful 1.9) would tell you this advice is rubbish at best. The early 98 and under cars are so old now, you'd better find one super cheap to make it worth the boat load of repairs you're sure to face. Don't even bother with the 1.9. The author's calling its' performance adequate is only accurate in the way you might consider the performance of a prius with flat tires 'adequate' and in fact many boring economy cars can get to 60 faster than a 4 cyl Z3, and don't likely blow headgaskets or leak oil near as badly. I have the 2000 2.8 six cylinder .. everything you write in this is spot-on, except you are seriously underselling the joy this car is to drive. I put sway bars into the suspension, and the back subframe has been fine ever since. Also, steel brake lines are a good improvement over aging hoses. Redoing the ODBC chip is a good idea for the 4-cylinder if you want to make it a bit more aggressive. I eventually reset my computer back to stock. I fitted the gadgets! Mine is a 1997, picked it up 6 months ago, I-4, E-36 chassis, 119,000 miles, Atlanta Blue, and Beige interior. My step son and I made some movie props: Stinger Missiles, Ejector Seat and Parachute Braking, all with EBay and craft store creativity. We added movie poster displays along with gadget charts, Bond in Motion T-Shirts from London, even the die-cast miniature on the dashboard! The crowd of over 1,500 loved it! Far from Aaron's assessment, this gem was well maintained, running fine, a joy to drive, and now a joy to display as it is tricked out with its Q Branch upgrades. I have offered the photos to Remmert. Perhaps on the website soon! I have to disagree with the 1st comment above! I believe this author is "right on the money" about these Z3's. I owned a brand new BMW Z3 (2.8L) and kept it for 7 yrs. (wish I had never sold it...great car). Now, years later in June of 2018, I purchased a 1997 BMW Z3 (1.9L) Atlanta Blue Metallic with black interior & top...for a very descent price. I upgraded the stereo (it already had 2 woofer speakers), new battery. I have owned a 2003 new Corvette and several other nice sports cars, but, the Z3 is by far....the BEST car I have ever owned or driven. I'm surprised how quick my Z3 is with a 1.9L engine (5 speed manual). I only drive my Z3 for FUN....maybe 100 miles per week. And as a professional designer for over 40 years, I have to say this 1997 BMW Z3 styling is one of the "best design styles" on any car out there...because, great designs are "timeless". This car is just too FUN...other cars just seem like "transportation" to me.